Sports Engine LLC significantly bolstered domestic sales efforts for its MOTOR TABS Fluid Replacement System brand this week as it entered a new distribution agreement with Quality Bicycle Products. In addition, the company hired four independent, outside sales representatives. "The combination of our own independent representatives with our existing distributor, BTI, and now QBP, will help us further penetrate the IBD marketplace," Greg Sellers, Sports Engine's manager said. "Retailers are embracing the sports tablet category, and we want to provide options to help make it simple to order product." The new hires include: Dana Carson (Eastern Pennsylvania, New Jersey, New York), Devon Cooper (Northern California/Northern Nevada), Kevin Hoard (Arizona, Las Vegas), and Michael Lax (Arkansas, Louisiana, Oklahoma, Texas). Available in Fruit Punch, Lemon-Lime and Orange, each 20-gram MOTOR TABS tablet delivers 250 milligrams of sodium, 75 milligrams of potassium, 16 grams of carbohydrate (dextrose, sucrose and maltodextrin). Waterproof, individual, foil packaging makes for clean, easy bottle refilling during training and racing. MOTOR TABS dissolution takes just a few minutes and there's no need to shake the bottle. With no residual settling, cleaning bottles and hydration systems is quick and easy, too. Designed for endurance and multi-sport athletes, MOTOR TABS packaging enables athletes to use one, one-and-a-half, or two tabs per bottle, depending on their individual fluid intake requirements, taste preference and sweat loss rates. There are 24 tablets per box, which has a $27.99 suggested retail price. Quality Bicycle Products will have product available for delivery in late June. Sports Engine LLC is a Tustin, Cal., based sports nutrition enterprise dedicated to developing products that help elite athletes, recreational athletes and casual exercisers perform at their best and ultimately have more fun on their chosen field of play. 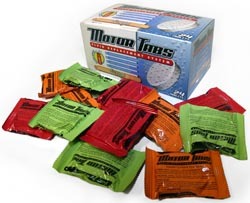 Learn more about the company and MOTOR TABS at www.motortabs.com or call 888.500.TABS (8227).